You must make reservations at least 5 minutes in advance of the time at Crossroads Saloon & Steakhouse. 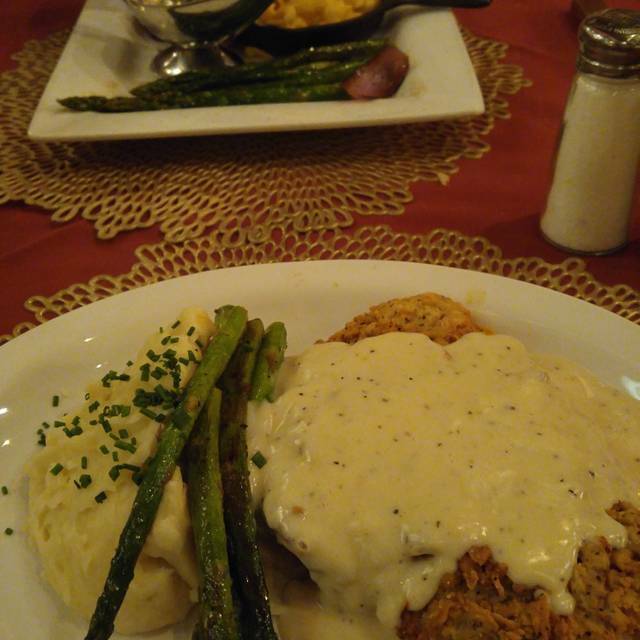 Crossroads Saloon & Steakhouse serves up some of the finest fare in the Texas Hill Country. 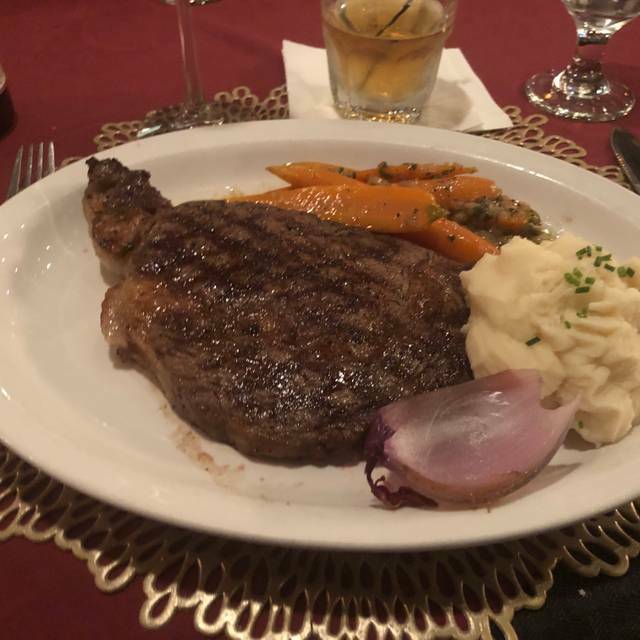 We proudly serve Niman Ranch, All Natural Angus Beef, Certified Angus Beef & U.S.D.A Prime Steaks, fresh caught seafood and homemade desserts. Our bar features locally brewed and imported beers, local Texas wines, and a complete selection of top shelf liquor. After dinner, relax and enjoy our beautiful patio with a cocktail - Thursdays thru Sundays we have live music! - Reservations are required for parties of 8 or more. - We are unable to seat incomplete parties. - Reserved tables have a grace period for 15 minutes after the reserved time. Jalapeños stuffed with smoked brisket and cream cheese, and wrapped in applewood bacon. Served with our house-made sauce. Bacon-wrapped jalapeno shrimp, cheddar grits and a house-made bbq sauce. Lump crabmeat salad stacked with avocados, pico de gallo and served with wonton chips. Seared crab and crawfish cakes served with Creole mustard crema and pico. Lightly fried, topped with shaved parmesan and served with red pepper aioli. Hand-battered crawfish tails served with Creole mustard crema. Mixed Greens, spiced pecans, dried cranberries, mandarin oranges and feta. Micro-greens, roasted beets, red onion, feta cheese and candied walnuts tossed with a citrus vinaigrette. Crisp romaine hearts and freshly-made croutons tossed with our house-made dressing. Fresh avocado served with dill chicken salad and a side of fruit. Crisp wedge of fresh lettuce, grape tomatoes, spiced pecans and bacon served with Maytag blue cheese dressing. Mixed greens, cucumber, kalamata olives, pepperoncini, tomato, red onion and feta served with Greek dressing. Julienned Granny Smith apples, hazelnuts, pomegranate, shaved Parmesan cheese with an apple cider vinaigrette. Grilled or fried shrimp over sautéed spinach and garlic mashed potatoes. Seared scallops, potato gratin, sautéed spinach with a roasted red pepper emulsion. Wild-caught salmon over sautéed spinach and garlic mashed potatoes topped with a lemon caper sauce. Please ask your server about today's fresh catch. Certified Angus Beef™ 16 oz. cut of prime rib. Slow cooked, served with choice of two sides, horseradish cream and au jus. Limited quantity nightly. 12 oz. center-cut NY Strip served with bacon-wrapped jalapeño shrimp, baked potato and asparagus. 14 oz. all-natural double bone chop served with garlic mashed potatoes, brussels sprouts and apple compote. Texas Quail Farms all-natural quail served with cheddar grits, asparagus, and avocado cream salsa. Crossroads' Low-Line Angus Beef. Served with garlic mashed potatoes, asparagus and topped with homemade peppered gravy. Half-chicken seasoned with fresh herbs, served with garlic mashed potatoes, asparagus and a whole grain mustard jus. CAB short rib served with parsnip puree, sauteed spinach and red wine demi-glace. Served with fries, chips or fresh fruit. Served with a choice of two sides. We proudly serve C.A.B. Niman Ranch Prime, All Natural Certified Angus Beef. Certified Angus Beef™ Chateau Loin, the heart of the sirloin. Certified Angus Beef™. Served with a mushroom and red wine reduction. Certified Angus Beef™ Niman Ranch Prime. Certified Angus Beef™ Niman Ranch Prime. Served with a red wine and shallot demi-glace. Steak Night and Happy Hour Every Wednesday, Thursday and Sunday! Steak Night is a Great Night! Every Wednesday, Thursday and Sunday get 1/2 off well, draft beer and select wine bottles as well as special prices on select cuts of steak! Crossroads is one of our favorite dining spots when visiting Fredricksburg. 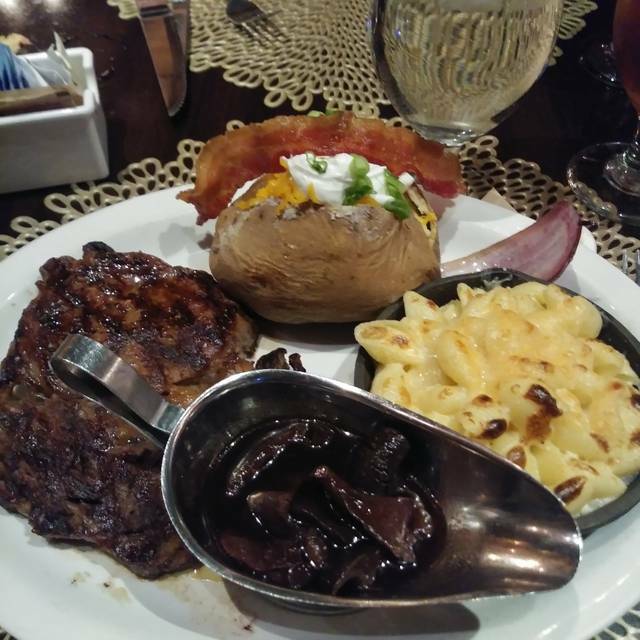 The steaks are always delicious and boot scooten in the saloon is a perfect way to finish off the evening. Be sure to order the brisket stuffed jalapeños for an appetizer. They are the best we’ve ever had. If you are looking for the BEST food and service in the hillcountry....Crossroads is the place. My husband and I celebrated our 24th Wedding Anniversary here at the advise of a family member. We both ordered the steak and it was good. My only complaint would be that it was slightly overcooked and the asparagus was undercooked. The room was nice and the waite staff very friendly. We very much enjoyed the music afterwards in the Saloon. When we arrived at 7:00pmour table was not ready wait time was only ten minutes. Waiter was polite but had communication problems with kitchen. Only two prime rib dinners left and he reserved them for us. We then ordered a crab appetizer which came on time About two minutes latter a server brought our dinner which was not good timing did not get a salad till dinner was over and took it home. Also the restaurant has lost its personality and the plastic place mats didn’t work for me. Prime rib so thin and tough. We had a large party (10 adults) and they did a masterful job of taking care of our table. 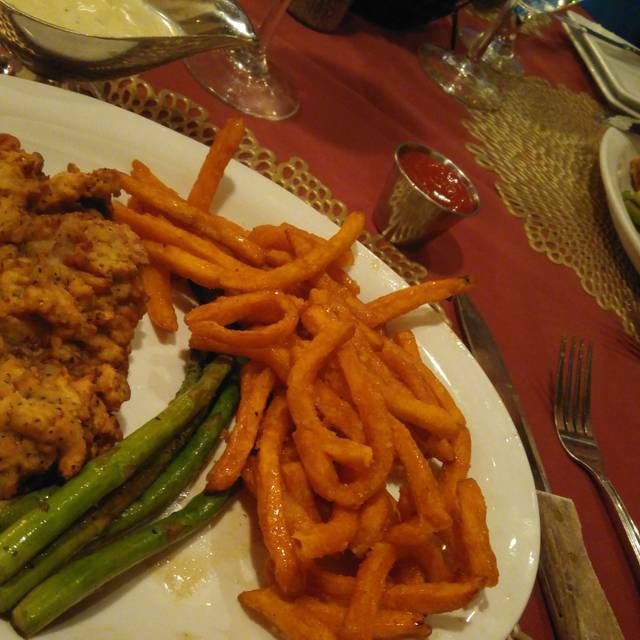 The food was some of the best we had in Fredericksburg! Our waiter was superb. Thoroughly enjoyed the whole evening. We had a reservation and were promptly seated down in the wine room where the ambiance is very nice. The service was great and very friendly. 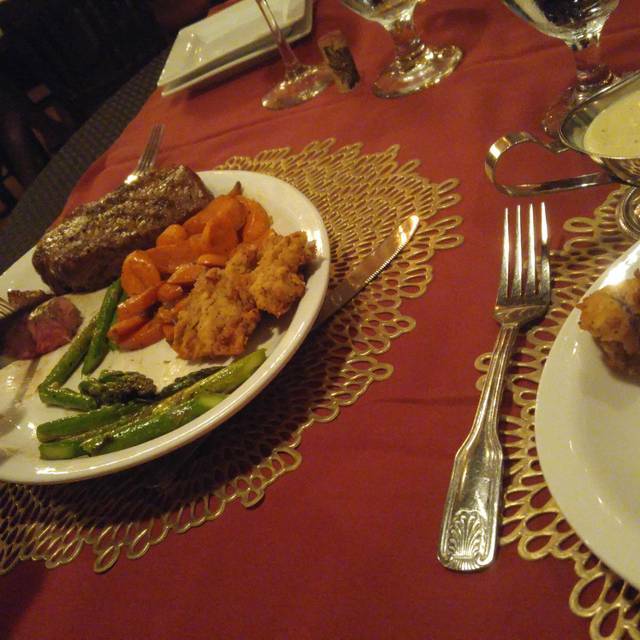 Steak and prime rib were absolutely delicious exceeding our expectations. Wine bottles were 1/2 off that night so made the meal an even better value. We will be back. Good food. Fun bar after supper. Had an awesome band. Fun time. Highly recommend Crossroads. And will be back next time. Ordered my steak medium well it was well done and burnt. We went to celebrate our anniversary and it was not worth it. Service was bad. The food was good and our server was very good. Bussing the tables was quick, but not attentive! As they removed flatware, it was not replaced as needed. The manager even brought out our salads, but when prompted, did not return with any flatware. Fingers are not normally used in our culture for salads. We did have to wait for about five minutes before even being able to flag a staff member for flatware. I would just rate this place as so-so or needs improvement! It was a nice restaurant! Filet mignon was cooked perfectly, pork chop was delicious and cooked exactly how I requested. Bar made the perfect old fashion and a solid selection of wines. All in all, it was a great experience and look forward to visiting again. The food was very tasty with a very nice selection of surf and turf. The wine list includes a Reserve selection which will have something for everyone. Sheldon was a great server!!! Looove this place. So do others so better have a reservation. Great value, especially if you are there on “steak night” ! Three nights a week. Know Sunday night but can’t remember other two. Great bands every time we’ve gone from dining to the bar...wear your boots & do some dancing!! Love Crossroads. Have referred many friends. We visit every time in Fredericksburg. We enjoy the setting, the service, and the food. We find the noise level excruciatingly high and this is the main reason we do not come often. The dining room itself is loud. Add in the noise (we would wonder if music describes what happens there) from the bar and conversation becomes painful. Similarly, we never go to the bar for drinks and dancing because of the decibel levels. One should not have to bend over the bar and yell at the bartender to get a gin and tonic. Not a musician but a lover of music, I can not understand the need for amplified sound in such a small space. Great food and service. Love the live music! I made a reservation for my husband and I for our anniversary celebrations. When i made the reservation i did specify it was for an anniversary. We were never congratulated by the hostess and at no point in our dinner it was mentioned. Food was ok, too much seasoning was added to everything. Restaurant needs some updating on the inside. Wouldn’t definitely come back. Not worth the money. Went here while we were in town for the weekend celebrating a birthday. Service was good. We had the steak and the pork chop. Food was above average. Had live music going on. Enjoyed the evening. Would be back again when we’re in town. I noticed every time I come the prime rib gets thinner and thinner. I could almost see through it this time. Food wonderful, ambiance pure Texas, service outstanding. This place did not disappoint. I only marked them down because the first two items I wanted from the menu they didn't have (prime rib and the scallops plate) so I settled for the 16 oz rib-eye. Cooked perfectly and the brussels sprouts will make you wanna slap yo mamma (although I don't recommend it). They had an Old Fashioned made with Bulleit Rye that has got to be one of the best I have EVER had. Would highly recommend this place but they don't take walk-ins, so make a reservation. Although the ambiance was very appealing, the fact that the Prime Rib, bottle of the Argentina wine sold by the glass and garlic butter were not available as early as 7:30 was alarming. When my medium sirloin steak came out a little charred and I cut into the smaller end side and it had no red, I was asked to cut in the middle. That was a little red, but 1/5 of the steak was at the smaller end and well done. I was asked if ok with it and accepted as is, a little surprised of the question. The service was excellent and the food was outstanding!! Had the sea bass on the special Valentine’s menu- it was delicious but party with us only wanted filet but on special menu had to order surf and turf. The band after dinner in the saloon was excellent! Nice place. Food good but nothing really special. Service was outstanding. Great food, good atmosphere and good service. We totally enjoyed our meal. Very good ambiance, interesting menu, fantastic service and food. Waiter was excellent! Will be back again soon! waitress forgot to put our ticket in. We had reservations at 7,had our apps by 715 and our food didn't arrive until 835 and it was cold. Waitress said she had "an issue printing our order"
Everything was wonderful. We had perfect steaks and the best peach turnover I've ever had! Great way to spend my husband's birthday evening. We'll be back. We enjoyed this restaurant. Sat in the back in a booth. The prime filet was tender and cooked to our liking. Caesar was good. Nice wine selection. A great solid meal. 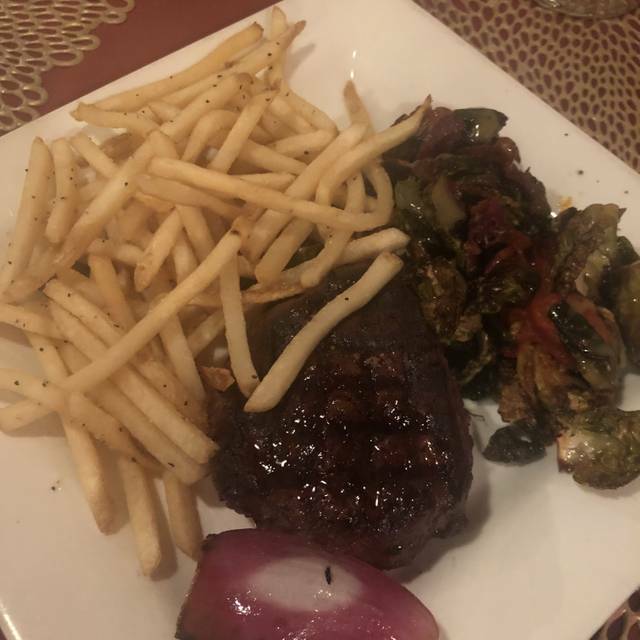 We went on a Thursday before the entertainment started, so the atmosphere was subdued and exactly what we wanted for a quiet steak dinner. We will be back and look forward to sitting up front in the bar area and experiencing the lively atmosphere, too. For $45 for a basic rib eye teak and baked potato, I expect an outstanding steak. This one was mediocre. Service was excellent. The saloon with band seems like a fun idea but we would have to hang out for an hour after dinner before they started playing and we were not in the mood for that. Should have had a warm up band so there was at least some music. Why is there not any Texas wine on the wine list? This is in Fredericksburg after all. Good food but a little loud because of the bar next door. Good service and nice ambiance. We made an 8pm reservation and showed up 5 min early... but despite having made the reservation 2 months in advance, we did not get seated until 9:20pm... what is the point of a reservation at that point? We were fortunate that a manager decided to wait on us, and we watched as many people who were seated before us waited for over an hour and a half to get any kind of food. Service was horrible and ruined what would have otherwise been a good experience because the food was very good.